God doesn’t give us what we can handle, He helps us handle what we are given. Your gifting and anointing is uniquely designed for you and your personality! We are each designed in peculiar ways. The Lord has anointed each of us for a special purpose: a mission on this earth. Even if someone has the ‘same’ gift as you, let’s say prophecy… the anointing will not operate in the same way as anybody else’s. We see many people being used of God, but this is not to say that they have been approved of God. Today, we see everyone is a prophet, everyone is a worshipper or everyone is an apostle. We are all worshippers, called to intercede, and are commanded to make disciples. Some people need to go back to humility school, and get rid of self-righteousness and the prosperity mindset. Remember, there will be a day when the Lord will say to some ‘depart from me, you workers of iniquity’; and these people also had the gifts of the Spirit. We must recognize that God chooses and decides who is gifted, and how. We do not know anyone’s story, only God does: only He knows our history, our private devotions and profound thoughts: only He decides timing, gifting and calling. There are many who wonder, and even envy those who are in ministry or who operate in the gifting. But little do they know the tests and the battles that these individuals have endured to be promoted. It is not accurate, or wise, to compare our calling, anointing or gifting to anybody else’s. The gifts of the Spirit are what you are on the inside, if you are a generous person: God will use your giving personality to bless others financially or materially. But He will try the called (you) in the area where they are gifted, by trying their faith and measure of surrender. The anointing that accompanies your calling determines where you function and how you operate in the body of Christ. For example, God will not appoint a person who is envious, lazy or greedy to function with the gift of generosity. 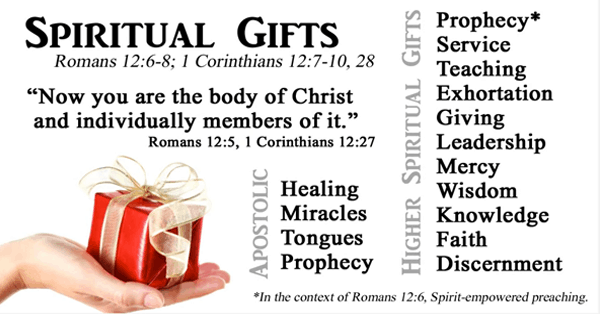 The gift God places in our Spirit, have a designated place which God has appointed. Like Joseph, who underwent a process of trials to finally get to the place God had appointed for him: the palace in Egypt. Joseph’s gift of interpreting dreams gave him insight to know there would be a time of famine, and a time of harvest coming. His anointing, the Spirit of God in him, enabled and instructed him on how to manage the situations that would arise: his land and neighboring nations would profit from His gift and anointing. Look at the prophets in the bible, they all operated in prophecy by the gifting of the Holy Spirit, but they all functioned differently in their anointing. We are also like these men of God, some of us are called to build, others to heal, to counsel, to exhort, and others to lead. God knows how to get us to the places and position we are called to be in, as long as we remain focused and do our best to be faithful. We all have different gifts which God uses the way He wants to. He does not have everyone to operate in the same ways, and remember to develop the fruit of the Spirit so that God’s name is not blasphemed because of you (Romans 2:24). Thank you Lord God, for your faithfulness and your grace. We ask you today to give us discernment and wisdom to appropriately function in our calling and anointing. May we not compare ourselves to any of our brothers or sisters, and may we not operate in falsehood. I pray for an increase in reverence, so that we may all continue to be sanctified by your Holy Spirit. In Jesus name, Amen.